Screenshot of the Scholia page for Plan S.
Last Monday the bomb dropped: eleven European funders (with likely more to follow) indicate that they are not going to support journals that are not fully Open Access, i.e. 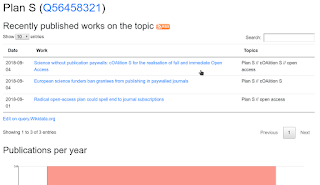 fully are partially paywalled journals: cOAlition S announced Plan S.
There is a lot of news about this and a lot of discussion: many agree that it is at least an interesting step. Some have argued that the plan advocates a commercial publishing model and that it accepts glossy journals. Indeed, it does not specifically address those points, but other news also suggests that this is Plan S is not the only step funders are undertaking: for example, the Dutch NWO is also putting serious effort in fighting the use of the flawed impact factor. One thing I particularly like about this Plan S is that it counters joined efforts from our universities (via the VSNU) with their big package deals that currently favor hybrid journals over full Open Access journals. That is, I can publish my cheminformatics under a Creative Commons license for free in the hybrid JCIM, where I do not get similar funding for the full Open Access JCheminform. I cannot stress this enough. Only with these core values, we can build on earlier knowledge and earlier research. It is worth reading all ten principles. We will see a lot of analyses of what will happen now. Things will have to further unfold. We will see that other funders will join, and we have seen that some funders did not join yet, because they were unsure if they could make the time line (like the Swedish VR). There are a few ways to keep updated. First, you can use the RSS feed of Scholia for both the Plan S and the cOAlition S (see the above screenshot). But this is mostly material with an DOI and not general news. Second, you could follow the oa.plan_s and oa.coalitions tags of the Open Access Tracking Project. research funders. Plan S ensures that these bare become 100% pure gold (yellow). It was noted (cannot find the tweet, right now...) that the amount of literature based on funding from cOAlition S is only 1-2% of all European output. That's not a lot, but keep in mind: 1. more funders will join, 2. a 1-2% extra pressure will make shareholders think, 3. the Plan S stops favoring hybrid journals over Open Access journals, and 4. the percentage extra submissions to full Open Access journals will be significantly higher compared to their current count. Also new this week: "Google Dataset Search"